"There's just so much beneath the streets of New York City that people walking around on the surface don't ever think about," journalist Will Hunt says. His new book is Underground. Hunt started out by exploring the city's sewers and subway tunnels, where he dodged trains and met a community of people who knew a version of the New York that was invisible to everyone else. "They knew the city's secrets," he says. "They knew the subterranean rivers and the abandoned subway stations and all of these places that the people on the surface never think about." Eventually, Hunt's curiosity took him to hidden places around the world, including the catacombs of Paris, underground cities in Turkey and the inner recesses of caves where ancient societies practiced religious rituals. His new book is called Underground. You register it at first as this subsonic rumble at your feet, and then you hear — or rather you feel — wind and suddenly there's this blast of of light coming behind you. What you have to do is jump up on the catwalk and run down the catwalk and find an emergency alcove where you can hide yourself while the train rushes past. Most people don't really have the experience of being near a train when it's moving at full speed. A train slows down to a platform usually so when you're in the tracks and you're kind of crouched in an emergency exit alcove the train is hurdling through the dark so you're getting this really intense sound and wind and this kind of rush of metal. Your heart is pounding. It's very intense. One of the things that I fell in love with right off the bat was this graffiti writer called Revs, who during the 1990s spent six years writing his autobiography on the walls of subway tunnels, which is to say between platforms in the sort of dark spaces that are hard to reach and covered in soot. It's like the no man's land. And he would go down and put up a five by seven foot rectangle of white or yellow paint and then write a little vignette from his childhood on the panel, and he would number them within a series and then sign it. And there are 235 of these panels scattered throughout New York City. When I was first starting to go down the tunnels I would come across these these pages and I just thought it was such a beautiful and mysterious art project. Today there are not so many, but there was one night where I went down to that tunnel with a group of urban explorers, and we celebrated the 50th birthday party of a woman named Brooklyn who had been living in that tunnel for 28 years, she said. We went down with whiskey and cake and we sort of sat around on the stairs outside of her home down there. ... In the eaves of the tunnel kind of in this alcove that was accessible by an iron staircase. She called it her igloo. There was a mattress and some sort of bent pieces of furniture. She was a really amazing woman, very charismatic and dynamic. That night she spent hours singing and dancing, and it was a really great party. It was sort of an extraordinary experience. At first, the sewer felt kind of repulsive in the way you would imagine. It's got this funk to it. There are these long, stringy strands of bacteria down there that urban explorers called snotsicles. So I'm kind of repulsed at first, but Steve [Hunt's guide to New York City's tunnels] tells me that there's a stream flowing through the the wastewater in this tunnel. We're walking up and down this this sewer pipe and there's something really beautiful about knowing New York City as this big growling metropolis. Is this like big tough place. And then to be under the streets feeling this ancient stream flowing around your boots, the city felt very vulnerable. It was like I was making eye contact with the city. It was kind of a beautiful moment. A lot of people are familiar with the the tourist track in the catacombs where you can walk down a tunnel lined with skulls and bones. So that runs about a mile, and beyond that there are 200 [more miles] of catacombs. ... It's just this wild, earthy honeycomb of stone tunnels that were originally dug as quarries. So all of the the elegant buildings along the Seine are made from blocks of limestone that were dug out from beneath the city. So the earliest tunnels there were dug, I believe, by the Romans who were in the city when it was known as Lutèce, and every subsequent people to populate the city of Paris has dug out this system wider and deeper. Today it's just this completely magical labyrinth down there. This is FRESH AIR. I'm Terry Gross. Ever been waiting for a subway and feel the impulse to hop off the platform and wander down the tracks or pop a manhole cover on a city street and go exploring the sewers? That's the kind of exploring our guest Will Hunt likes to do, looking below the surface of streets and of the earth. 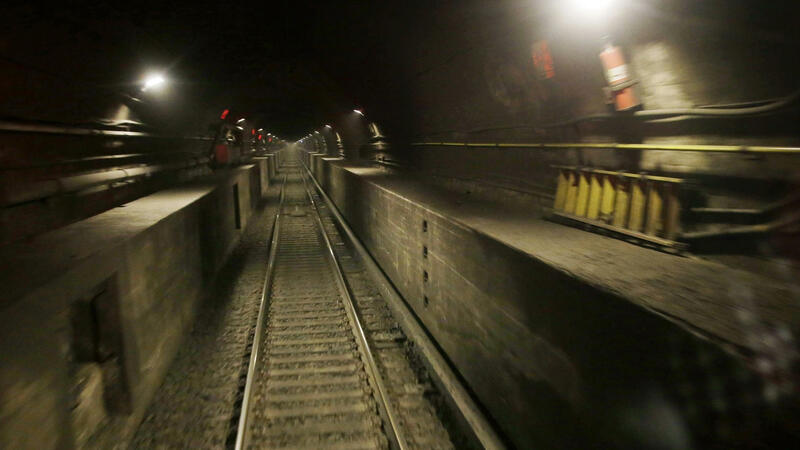 He's spent years prowling the inner recesses of subways and sewers, the catacombs of Paris, abandoned mines and nuclear bunkers and caves where ancient societies held religious rituals. His new book shares some of what he's found, like people living in subway tunnels and underground art in Paris. And he explores why some people just seem compelled to burrow into the ground. Will Hunt's writing and photography have been published in The Economist, The Paris Review and Outside magazine. He spoke to FRESH AIR's Dave Davies about his new book "Underground: A Human History Of The Worlds Beneath Our Feet." DAVE DAVIES, BYLINE: Well, Will Hunt, welcome to FRESH AIR. You describe in this book getting interested in things under the ground. And being on a subway platform, and you see these two guys emerge from the tracks, like, with headlamps on. And they just walk up the stairs. Who were they? What was going on? WILL HUNT: So these were urban explorers. This is a tribe of people in New York City who have dedicated their lives to exploring and documenting the lost and forgotten parts of the city. And I just became totally fascinated with them. They were these sort of urban outlaw poets, and I love that they sort of saw a version of New York City that was invisible to everyone else. They knew the city's secrets. They knew the subterranean rivers and the abandoned subway stations and all of these places that people on the surface never think about. So I just became fixated on them and started poking around with them in tunnels and sewers and in other places out of sight. DAVIES: Right, so you became one of these explorers. How easy is it to hop into the subway and disappear? HUNT: Practically, it's not so difficult. It's just a matter of going down late at night and waiting for a train to pass and deciding to step over the do not cross or enter track sign and just heading down the catwalk. I would say, psychologically, it's much more difficult. It's very frightening down there, and there's a lot of - there's a lot of pressure. And you're thinking a million things at once. And you're listening for trains, and you're listening for track workers down there. And it's illegal of course. So if you get caught, then the consequences are dire. HUNT: There are rats indeed. You know, there are a lot of hazards down there. I mean, when you get into tunnels that have a - sort of a tight corner, that can be very scary 'cause you can't see the trains coming around the corner so easily. There are these passengerless (ph) garbage trains that come through. And they don't really run on a schedule, so they can come up behind you at any time. I was fortunate enough never to have witnessed one of those, but that's always in the back of your mind. It can be pretty treacherous down there. DAVIES: So what would you do when you were in the subway and a train came? HUNT: This was always unnerving to be down on subway tracks and to have a train come up behind you, right? You - it registers first as this kind of, like, sort of subsonic rumble at your feet. And then you hear - or, rather, you feel wind. And suddenly, there's this blast of light coming behind you. And what you have to do is jump up on the catwalk and run down the catwalk and find an emergency alcove where you can hide yourself while the train rushes past. And the truth is, you sort of plan for trains passing. What I would do is I would enter the subway tracks and run down the catwalk and kind of hover around the emergency exit alcove and wait for a train to come. And the train would come, and I would still be hidden. And then once the train was gone, I would be able to safely continue down the tracks. DAVIES: And what did it feel like when the train went by? HUNT: Most people don't really have the experience of being near a train when it's moving at full speed. You know, a train slows down at a platform usually. So when you're in the tracks and you're kind of crouched in an emergency exit alcove, the train is hurtling through the dark. So you're getting this really intense sound and wind and this kind of rush of metal. And it's - you know, your heart is pounding. It's very intense. DAVIES: What kind of gear do you need to do this, to stay safe? HUNT: I would just go down with - wearing dark clothes and a headlamp or a flashlight and just shoes with good traction. That's all you really need. I should say that I don't condone doing this. This is - it's very dangerous and a good way to get arrested. And I don't want people listening to this and thinking they should go and run down the tracks at night. DAVIES: You described some fascinating stuff you discover. There were dangers and difficulties, but what did you discover that fascinated you? HUNT: Well, there's just so much beneath the streets of New York City that people walking around on the surface don't ever think about. I mean, one of the things that I fell in love with right off the bat was this graffiti writer called Revs who, during the 1990s, spent six years writing his autobiography on the walls of subway tunnels, which is to say between platforms in the sort of dark spaces that are hard to reach and covered in soot. It's like the no man's land. And he would go down and put up a 5- by 7-foot rectangle of white or yellow paint and then write a little vignette from his childhood on the panel. And he would number them within a series and then sign it. And there are 235 of these panels scattered throughout New York City. And when I was first starting to go down into the tunnels, I would come across these pages. And they were - I just thought it was such a beautiful and mysterious art project. DAVIES: And you discovered there are people there. You refer to the mole people. Who are they? DAVIES: And could you just describe the home? Where was she living? HUNT: It was in the eaves of the tunnel kind of in this alcove that was accessible by an iron staircase. She called it her igloo. And, you know, there was a mattress and some sort of bent pieces of furniture. She was a really amazing woman, very charismatic and dynamic. That night, she spent hours singing and dancing. And it was a really great party. DAVIES: So you went through the subways, and you went through sewers, too - right? - a fair amount. HUNT: I did. So I sort of started following around an urban explorer called Steve Duncan, who is kind of the master urban explorer in the city. And when I - he took me down into a sewer in Brooklyn kind of near the Brooklyn Navy Yard. And we climbed down, and it was sort of an extraordinary experience. At first, the sewer felt kind of repulsive in the way you would imagine. You know, it's got this funk to it. There are these long, stringy strands of bacteria down there that urban explorers called snotsicles. So I'm kind of repulsed at first, but Steve tells me that there's a stream flowing through the wastewater in this tunnel. And so I'm - we're walking up and down this sewer pipe. And there's something really beautiful about knowing New York City as this big growling metropolis - this, like, big, tough place and then to be under the streets feeling this ancient stream flowing around your boots. The city felt very vulnerable. It was like I was making eye contact with the city. It was a kind of beautiful moment. DAVIES: So there are sewers. There are subways. There are underground streams in cities. A lot of people don't realize this. As you became more familiar with this, did it just change your perception of the city you lived in? Did you talk about it with friends? Did you say, hey, you don't know what's, like, a block away here? Did you find yourself wanting to lift every manhole and go down it? HUNT: I absolutely did. I - there was a time when I would just move through the city in a kind of delirium. I was - you know, every manhole, every doorway, every stairway going down into the dark felt like a potential portal into this, like, separate world. My friends at the time would get so tired of me telling stories about all these spaces. I remember finding a building in Brooklyn Heights that looked exactly like every other building on the street except that the windows were blacked out and the door was made of dark steel. And as it turns out, the building was a subway vent, and it had been disguised. And it was just this beautiful thing of recognizing that hidden in the sort of texture of the city all around you are these portals into this, like, hidden layer. And, you know, the city, it started to feel really magical to me. DAVIES: Our guest is Will Hunt. He has written a new book about life underneath the earth. It's called "Underground: A Human History Of The Worlds Beneath Our Feet." We'll continue our conversation in just a moment. This is FRESH AIR. DAVIES: This is FRESH AIR. And we're speaking with Will Hunt. He is a writer who has a fascination with things beneath the surface of the earth. His new book is "Underground: A Human History Of The Worlds Beneath Our Feet." You have a fascinating chapter about the underground in Paris, and you describe an expedition that you and - what? - three or four friends took - a two-to-three-day trip where you were going to basically traverse the city of Paris south to north, if I recall, underground, right? HUNT: That's correct. This was a few years ago. I was with a team of six urban explorers. And the plan was to go from one edge of the city to the other using only subterranean infrastructure. And we started on the southern edge of the city, and our path was going to be through the catacombs and then through utility tunnels to go under the Seine and then ultimately into the sewers. So we went down on a June night starting in the catacombs. We were aware of a number of hazards. It was all illegal, of course, so we had to avoid the police. We were also aware of sort of bad air that sometimes collects in unventilated underground tunnel, so we had these, you know, toxic air detectors. But most of all, we were concerned about the weather. This was June in Paris, which means rain. And we were nervous about going into the sewers and getting caught in a rainstorm. The way the sewer system works in Paris - if you're in a sewer collector during a rainstorm, you could get caught in a flash flood. So we start in the catacombs, kind of winding through this maze of very beautiful stony tunnels. We emerge in the catacombs and head into the utility tunnels and slip under the Seine. And as we're making the transition from the utility tunnels to the sewers, we have cell phone service for a second. And we get a message from a friend of ours who had agreed to be the sort of weather sentinel. And he says it looks to be a wet night. So now we're standing in a sewer collector, and we have a decision to make. Are we going to push through this collector and risk getting caught in a rainstorm? Or are we going to to give up the expedition and turn back? And at this point, we'd been underground for 30 hours. So we all went around the circle and said, you know, we have to do this. There's no turning back. So over the next hour or so, we were kind of tiptoeing down this sewer collector, and it's this big echoing pipe with a channel of sewage running down the center. And it was extremely intense. Occasionally there would be these jets of water coming out of the walls - and everything is magnified down there. So a jet of water would come come out of a pipe in the walls, and we would all freeze thinking that this is it. There's a rainstorm coming. In the end, we did make it out. We climbed up through a manhole just outside the northern boundary of the city, emerging at the foot of a restaurant in the street. And, you know, we surprised all these people, who were sitting and eating lunch. A waiter spilled a tray of silverware on the street as six people climbed out of the underground, you know, spattered in all forms of ejecta. And then we scouped across the street and had a - opened a bottle of Champagne to celebrate. DAVIES: Tell us a little bit about the Paris underground. I mean, it's - there's a storied history of the catacombs. Just describe a bit for us. HUNT: So a lot of people are familiar with the tourist track in the catacombs, where you can walk down a tunnel lined with skulls and bones. So that runs about a mile. And beyond that, there are 200 miles of catacombs beneath the city. It's just this wild, earthy honeycomb of stone tunnels that were originally dug as quarries. So all of the elegant buildings along the Seine are made from blocks of limestone that were dug out from beneath the city. So the earliest tunnels there were dug, I believe, by the Romans who were in the city when it was known as Lutece. And, you know, every subsequent people to populate the city of Paris has, you know, dug out this system wider and deeper. And today it's just this completely magical labyrinth down there. DAVIES: You have a chapter called "The Burrowers," and you begin with the story of a guy named William Lyttle, an Englishman. Tell us about him. HUNT: So in the 1960s, this man named William Lyttle, who lived in the London neighborhood of Hackney, decides that he wants to dig a wine cellar under his house. So he goes down into his basement with a shovel and starts digging, and he works for several hours and is able to hollow out a chamber large enough to keep wine. But then something strange happens. He can't stop. Something inside of him snaps, and he can't stop digging. And he keeps digging and keeps digging and digs for 40 years. He spends, you know, all this time excavating a kind of hidden network of tunnels beneath his house. I think it would go down maybe 60 feet and 40 feet in either side. It was to the point where his neighbors at night could hear him kind of scratching away in the tunnels beneath their gardens. HUNT: And then, in 2006, the street in front of his house collapsed. One of the tunnels had given way. And this sort of secret labyrinth that he had created was revealed to the public. And the city council came in and inspected and realized that the house was not livable. You know, as William Lyttle had become obsessed with digging tunnels, he had stopped keeping up his house. So everything was overgrown and falling apart. And the city council come in, and they say, OK, you can't live in this house anymore. And they remove him to, like, a city-owned highrise. And they put him in an apartment in the highest story so as to preclude the urge to burrow. HUNT: (Laughter) And, you know, meanwhile he's become a kind of folk hero in the neighborhood of Hackney. Everyone knows about William Lyttle. Everyone - you know, he's in the tabloids as the Mole Man of Hackney. And he's doing interviews. And what fascinated me about William Lyttle is that he never could give an explanation for what compelled him to burrow. He would give these interviews to tabloid journalists. And they would say, like, what - you know, why are you doing this? And he would sort of shrug and say, I guess I'm just a man who likes to dig. DAVIES: (Laughter) Will Hunt, thanks so much for speaking with us. GROSS: Will Hunt is the author of "Underground." He spoke with FRESH AIR's Dave Davies, who is also WHYY's senior reporter. Coming up, Maureen Corrigan reviews the new novel "The Falconer." And we'll listen back to my 1996 interview with Oscar and Grammy-winning French composer Michel Legrand. He died Saturday at the age of 86. Here's Legrand at the piano playing music from "The Umbrellas Of Cherbourg," the part which was adapted into a hit song with English lyrics titled "Watch What Happens." He wrote all the music for the film. I'm Terry Gross, and this is FRESH AIR.